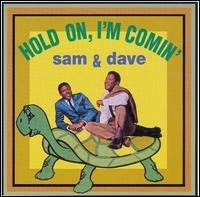 Sam & Dave were an American soul duo, best known for their string of hits in the 1960s. Sam Moore and Dave Prater both had backgrounds in gospel music, and this proved to be a vital ingredient of their vocal delivery when they began singing secular R&B. By the 60s they were both working the R&B circuit individually, and their paths crossed in Miami in 1961. They quickly formed a duo, and were signed to Marlin Records. Between 1962 and 1964 they released a number of singles on not just Marlin but the Roulette and Alston labels as well, and though they managed to get some regional airplay they achieved no national success. All this changed in 1964 when they were signed by Jerry Wexler to Atlantic Records. Wexler recognised the gospel roots which drove their energetic live shows, and hoping to capture this on record he sent them to Memphis to record at the Stax studios. With the Stax staff they succeeded in capturing this energy, backed by Booker T & The MGs and recording the songs of the songwriting team of Isaac Hayes & David Porter. Their first two singles with Stax didn't chart, but they finally scored a hit with "You Don't Know Like I Know", which got to #7 on the R&B chart in 1965. An even bigger hit followed when "Hold On, I'm Comin'" topped the R&B chart and also broke through to the pop chart at #21. This proved to be the huge breakthrough everyone had been waiting for, not only for Sam & Dave but Hayes and Porter and everyone else at Stax. With equally successful hits from Otis Redding and Wilson Pickett, 1965 and 1966 were the years that saw Stax first take the down-home sound of Memphis Soul into the pop charts. An album was quickly put together to capitalize on the single's success, a great collection of raw, gritty Southern soul numbers, mostly written by Hayes and Porter (with a few from other members of the Stax staff such as Eddie Floyd). The album is also notable for having what is surely one of the worst covers of all time!